Wifestyles Blog & Photography: Link up VLOG! do another VLOG with my husband anywhere near me! I'm so glad I decided to participate in this fun link up with Becky and Raven! You heard him correctly, YOLO! So cute! It came out great. Sorry about that, had WAY too many incorrectly spelled words. You are soooo stinkin cute! 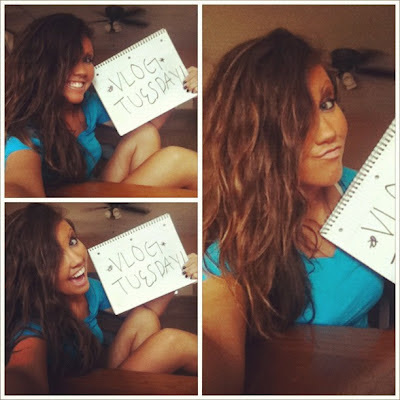 You are great at vlogs sweetie :)! haha you are the cutest!! i love your husband in the background. so cute! Cute video! Love all those shoes! Omg you are so cute! Stopping by from the linkup!!! I love your hair it's fabulous! & also reminds me of mine! Haha! New follower! Such a cute vlog!! Your husbands editions were great! My hubby was out of the house when I did mine. Otherwise, I'm pretty sure we'd have the same VLOG. hahaha Too cute!! I use Herbal Essence's "Tousle me Softly" for my waves...I love it! Have you ever used it before? Cute vlog. I loved your shirt but not as much as I loved your puppy! Your husband just made it fun! Great job girl! super cute shoes. Im guessing you don't have big ol size ten feet like me so we can share shoes?? seriously you are too cute. LOLOL to the YOLO!! Your husband is cracking my UP!! and omg to the dog clothes. That is great. This was so cute! Thanks so much for linking up!! haha love this!! I love how you are so cute & comfortable in front of the camera - especially with your husband in the same room!! I couldn't do it with B in the room, ha! um my husband wouldnt be in the same room with me when i vlog just because he thinks its the weirdest thing EVER. and if he hears me listening to my vlog... he freaks! Your vlog turned out great! You are too precious! The puppy is so cute too! Visiting from the link up!